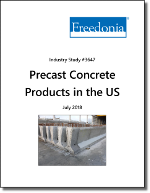 This study on precast concrete products has 34 figures, 37 tables, and 100+ pages of analysis on the industry, including what segments offer the best opportunities for growth. Demand for precast concrete is expected to grow 3.8% per annum through 2022. Gains will be driven by an increase in commercial and nonbuilding construction activity. Increased adoption of precast concrete products will further boost demand, as more builders select the material because of its durability and ability to reduce construction project time. Will the United States market see growth in this industry? Yes! With expansion in commercial building construction activity, especially for offices, industrial buildings, and healthcare facilities, demand is forecasted to grow 3.8% annually through 2022. Other major growth factors industry participants should be aware of include growth in spending on highways and bridges and increased adoption of precast concrete products because of their durability and consistent quality. What product categories are covered in this Study? What precast concrete market segments are analyzed? Is precast concrete demand presented on a US regional level? How does Freedonia conduct research? Freedonia analysts consult a wide range of primary and secondary sources. Primary information was gathered through consultations with personnel of participating companies and other industry specialists. Corporate annual reports, SEC Form 10-K and 20-F filings, product catalogs, and other company information were also used extensively in framing the industry and market environments, and as input for market size assessments. The value of the US precast concrete market in 2017 had a vast majority of demand supplied by US-based manufacturers. Trade plays a very small role in the industry because many precast concrete products are large and heavy and thus costly to ship over long distances. The US was a net importer of precast concrete products in 2017, with imports accounting for 1.6% of domestic demand. Precast concrete shipments are also forecast to expand 3.8% annually through 2022. A number of US-based firms increased their production capacities in 2018 in response to market growth in recent years, including Coreslab Structures and Tindall. Why is trade important in this industry? Moves such as this will allow industry output to rise along with domestic demand, and the US trade balance is expected to remain largely unchanged through 2022. What are historical market trends for precast concrete products? Over the last decade, precast concrete demand has generally tracked construction expenditures because the vast majority of precast concrete products are sold to the construction industry. Precast concrete demand experienced a double-digit decline in 2009 as commercial building construction activity collapsed due to the 2007-2009 recession. Precast concrete demand rebounded in 2012 due to a recovery in commercial construction spending and renewed strength in residential and nonbuilding construction activity. What were the recent mergers or acquisitions? What role does distribution & marketing play in precast concrete products? Which regions are top performers? Does the East have better opportunities for growth than the West? What factors are affecting demand for septic tanks and other water & wastewater handling products? Is demand growing more for structural building components or architectural? Contact your Freedonia sales rep today to find out more information or call and ask for redacted tables at +1-440-684-9600.